WE breed only Multi Generation Labradoodldes in California. our dogs are 55-65 pounds! 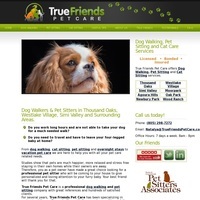 True Friends Pet Care- Dog Walking &amp;amp;amp; Pet Sitting offers customized in-home pet care services in Westlake Village, Thousand Oaks, Oak Park , Simi Valley, Moorpark and Agoura Hills. True Friends Pet Care is Licensed, Bonded and Insured. We provide a wide array of pet sitting services. You can choose from: Daily Dog Walks, Cat Sitting, Vacation Pet Care, Overnights.